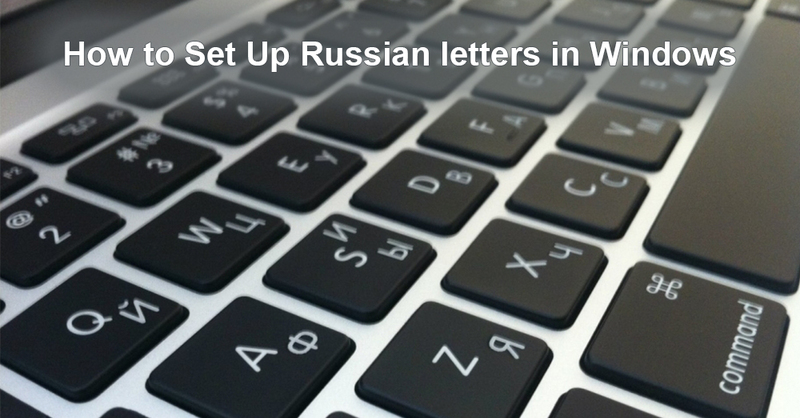 Everybody who studies the Russian language faces the problem of how to set up Russian letters on their keyboard. It’s is especially important when you use somebody else’s computer or have just bought a new computer. Today we are going to tell you how to change the input language in Windows 8 and Windows 10. First, press “Start” in the left low corner, then got to “Control panel”. In the section “Clock, Language and Region” next to the icon with the clock and planet choose “Add a language”. Find Russian in the list of languages and press “Add” in the right corner. You can press the search icon in the left corner of the task bar and enter the word “Region”, then click on “Region & language settings”, then click on “Add a language”, choose Russian from the list of languages, and all done! There are webpages that provide the opportunity to type in Russian anywhere around the world, at any computer, and free of charge. On this kind of webpages you can type in Russian by using either the mouse or keyboard. It is very convenient if you rarely use Cyrillic or only write short texts, messages, etc. If you have already managed to change the input language but you have no idea how Russian letters are located, you need the On-screen Keyboard. In Windows 10 you can find it using the search engine. You should simply enter “On-screen Keyboard”. In Windows 8 you should go to “Control panel” , then in the section “Ease of Access” press the tab “Start On-screen Keyboard” . The quickest way to enable the on-screen keyboard in both Windows 8 and Windows 10 is the combination Windows + R. And after that enter “osc”, and all done! If you plan to type in Cyrillic, we recommend you to buy special stickers on your keyboard. They are really cheap, but they are as good as gold.